Standing on rue Saint-Louis or Sainte Anne in Vieux Quebec, the old walled city of Quebec, it's easy to imagine that somehow you've arrived in France without having taken a plane or boat to get there. Cobblestone streets, cafes with unscreened windows thrown open to the sidewalk, folks walking home with fresh baguettes and cheeses, table d'hote service all add to the ambience as do people speaking French, the language of the city and Belle Province. Old Quebec sitting high on the bluff above the Saint Lawrence River, and Quartier Petit-Champlain the lower town, at water's edge, have roots that date to the beginning of the seventeenth century. Due in part to their visual and built heritage, both areas possess a character and charm that eludes most North American cities. 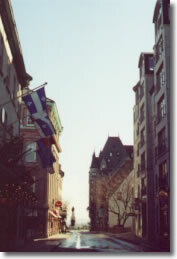 Even the area, not encompassed by the fortification, which is home to the Parliament buildings, exciting Grand Allee and Rue Saint Jean with its many churches, epicerie, cafes and unique shops, has qualities that endear it to visitors who return time and time again to partake of its many amenities. 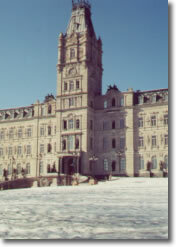 The province's stunning stone parliament building, known as the National Assembly, was constructed in 1877 in Second Empire style with mansard roof. 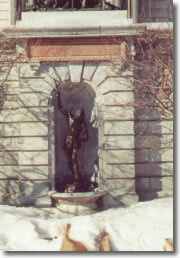 Its front facade features niches for statuary. At the moment there are twenty-two bronzes on display, all of men and women who have played an important role in provincial history. Two of the most impressive are the Fisherman with Spear and the Amerindian Family both embraced by a circular stone stairway that leads to the building's main entrance. Tours highlighting the building's interior are offered. From Parliament Hill you can see the beginning of Grand Allee, the gates and Old City, the Citadel and the entrance to the Plains of Abraham. 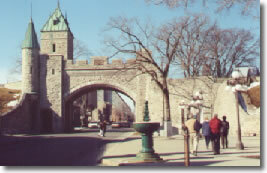 Old Quebec is one of the oldest and the only fortified, walled city north of Mexico. It was declared a world heritage site by UNESCO in 1985. The fortification, a high stone wall that runs for more than 4 kms, surrounds the original town. Walk through any of its four gates and you are immediately transported into a different sense of time and place. 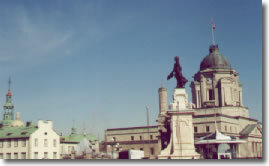 The first indications that the area is special are the large number of spires and statues, the distinctive architecture of older buildings and narrow winding streets, many leading to Dufferin Terrace and the mighty St. Lawrence River. In this area, architectural delights include examples in the Norman fashion, habitant influenced or second Empire style. You'll find some great examples of 1690 through early 1800's built heritage. It's a pleasant surprise to find that all a building's levels are used for shops, restaurants, accommodation or as private residences. 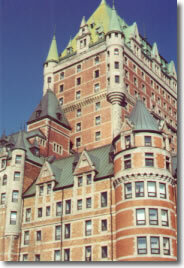 The skyline of Old Quebec is dominated by the impressive Chateau Frontenac, one of the most well known railroad hotels in Canada. Due to the fact that the hotel was built in the castellated style, it is not out of place, sitting as it does high on the bluff overlooking the river. Going out for Sunday breakfast is a Quebec tradition and there's no better place to partake this meal than the buffet at the Terrace Café in the Chateau Frontenac, followed by a guided tour of the c1893 portion of the hotel, conducted by costumed staff. 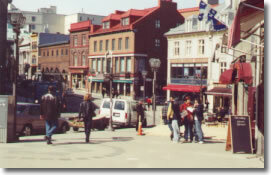 Prior to undertaking a major exploration of the area, drop into the Information Centre at the corner of Sainte-Anne and Fort Streets for a good map and list of must-see attractions. As the history of Quebec is so interesting one of your first stops should be the multimedia presentation entitled Quebec Experience. Through 3D imagery, virtual characters, animated sets and a water screen, visitors travel through time while learning the history of Quebec. 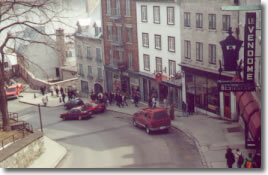 For an overview of the area's military history, drop into Musee du Fort, across from the Information Centre for a comprehensive light & sound diorama that explains the four major battles for old Quebec. We spent several days exploring the Old City and managed to cover about one quarter of the streets. Of course our wanderings took us into many of the shops including La Corriveau, on Cote de la Fabrique. The shop boasts three floors of Canadiana, their motto being Think Canadian, See Canadian, Buy Canadian. We also dropped in to see A Fantastic Village, on rue de Buade, a permanent Christmas village display utilizing, among its well presented displays, at least 275 porcelain buildings and 1,500 figurines. Hungry? 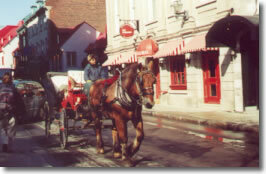 A visit to Quebec City, the gastronomic capital of Canada, involves many great dining experiences. With more than seventy restaurants to choose from, you'll have a hard time deciding where and what to eat. 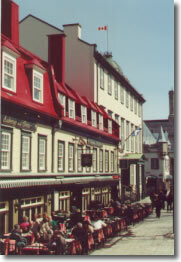 Many feature distinctive regional Quebec cuisine and serve the main meal, table d'hote, at the noon hour. In the Old City, a reasonably priced meal can be found at Le Figaro on rue Saint-Louis. Try their creamy shrimp soup and warm quiche. With salad and dessert included, our bill came to under $20. For an exceptional dining experience, book a table at La Maison Serge Bruyere at the corners of Coulliard and Garneau Streets where they meet with Saint-Jean. In gracious dining rooms on the second floor, wonderful four course meals are served with style and panache. If la grande table doesn't suit your pocket book, enjoy a meal in their Irish Pub. Located on the restaurant's lower level, the pub has vaulted ceilings that date back to an era during the 1700's when the building was used to store ammunition. While in the pub, keep your eyes open for entrances to secret tunnels. Time your visit for a Thursday evening when toe-tapping live music, Irish style, is presented. Any visit to Old Quebec ends with a walk on Dufferin Terrace with its graceful gazebos and statue honoring Samuel de Champlain. With the Chateau Frontenac as a backdrop and the St. Lawrence and Petit Champlain below, there's no better place to be on a sunny day in April or October when thousands of Canada and snow geese wend their way to Baffin Island, using the river to guide their journey. Formations stretch for miles up and down the river valley; their plaintive honking adding a poignant touch to the atmosphere. 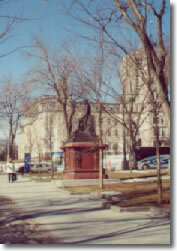 The Governors Promenade begins at the western end of the Terrace and leads to the Plains of Abraham. 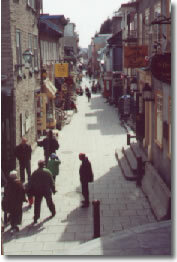 At the eastern end, steps lead to Petit Champlain, the lower town. 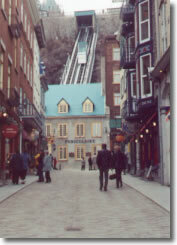 You can ride the Funaculaire du Vieux-Quebec, a glass enclosed cable car that runs at a 45 degree angle up the bluff from one level to the other. It's more fun to take the steps down and the cable car up again. 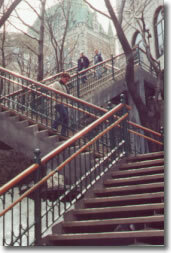 At the bottom a short walk down Cote de la Montagne brings you to a set of steps leading to vibrant Petit Champlain. 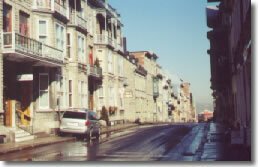 The street is lined with buildings exhibiting excellent early architectural styles. 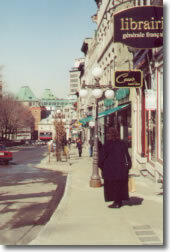 Many are now cafes and specialty shops. 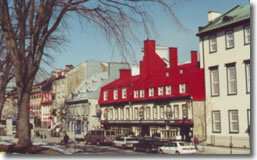 Two of the oldest buildings in Quebec, Place de Paris and Place-Royale, are located in the lower town. While at the bottom, catch the ferry across the St. Lawrence for great views back toward Quebec City. The round trip takes approximately thirty minutes and gives the opportunity to rest weary feet. You don't have to get off on the far shore. Don't forget your camera. You'll want to take pictures of Old Quebec and the lower town from the river. One of your last stops in Old Quebec should be at Cathedral Notre-Dame-de-Quebec. Although the original church burned in 1922, the present structure represents all the most interesting secular architectural features and is one of the most beautiful in Quebec. The history of the parish goes back to the mid-seventeenth century and Monsignor Francois de Laval. Tour the Crypt and if visiting between May and October, stay for an excellent thirty minute sound and light show, Quebec in the Limelight. It's hard to believe that in a country as young as Canada, Quebec City is gearing up for its four hundredth birthday in Y2008. Its earliest history can be traced back to France and Jacques Cartiers exploration of the St. Lawrence River in the sixteenth century. Don't let the fact you might not be able to speak French keep you from enjoying one of the most unique and beautiful cities in North America. 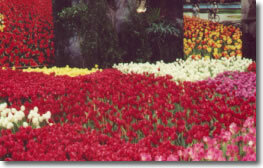 The area is geared to tourism. Many industry workers can speak three or four languages. Journey. Relax. Enjoy! You'll have a wonderful time.